John Milton Chivington (January 27, 1821 – October 4, 1894) was a former Methodist pastor who served as colonel in the United States Volunteers during the Colorado War and the New Mexico Campaigns of the American Civil War. In 1862, he was in the Battle of Glorieta Pass against a Confederate supply train. The Joint Committee on the Conduct of the War conducted an investigation of the massacre, but while they condemned Chivington's and his soldiers' conduct in the strongest possible terms, no criminal charges were brought against him or them. The closest thing to a punishment Chivington suffered was the effective end of his political aspirations. Three years prior to Sand Creek, on August 2, 1861, he became the first Grand Master of Masons of Colorado. Several Freemasons, some of whom were present at the Sand Creek Massacre, objected to Chivington's actions and publicly denounced them, while others supported him. Officially, the Masons in Colorado suspended Chivington  until the report from Congress, after which his membership was reinstated. The Freemasons, including Chivington and the first Governor, John Evans, were instrumental in pressing for Colorado statehood. When the Civil War broke out, Colorado Territorial Governor William Gilpin offered him a commission as a chaplain, but Chivington refused it, saying he wanted to fight. He was commissioned a major in the 1st Colorado Volunteers under Colonel John P. Slough. During Confederate General Henry Hopkins Sibley's offensive in the East Arizona and New Mexico territories, Chivington led a 418-man detachment to Apache Canyon. On March 26, 1862, they surprised about 300 Confederate Texans under Major Charles L. Pyron. The startled Texans were routed with 4 killed, 20 wounded and 75 captured, while Chivington's men lost 5 killed and 14 wounded. This small victory raised morale in Slough's army. On March 28, Slough sent Chivington and his men on a circling movement, with orders to hit Sibley in the flank once Slough's main force had engaged his front at Glorieta Pass, New Mexico. Chivington got into position above the Pass, but waited in vain for either Slough or Sibley to arrive. While they waited, scouts reported that Sibley's entire supply train was nearby at Johnson's Ranch. Chivington's command, among whom there was a detail of Colorado Mounted Rangers,  descended the slope and crept up on the supply train. They waited for an hour in concealment, then attacked, driving off or capturing the small Confederate guard detail without any casualties. Chivington ordered the supply wagons burned, and the horses and mules slaughtered. Meanwhile, the Battle of Glorieta Pass was raging at Pigeon's Ranch. Chivington returned to Slough's main force to find it rapidly falling back. The Confederates had won the Battle of Glorieta Pass, but because of Chivington and his forces, they had no supplies to sustain their advance and were forced to retreat. Chivington had completely reversed the result of the battle. Sibley's men reluctantly retreated back to Texas and never again threatened New Mexico. Chivington earned high praise for his decisive stroke at Johnson's Ranch, even though his discovery of the Confederate supply train was accidental. Critics have suggested that had Chivington returned quickly to reinforce Slough's army when he heard gunfire, his 400 extra men might have allowed the Union to win the battle. In April 1862, Chivington was appointed colonel of the 1st Colorado Volunteer Regiment of Cavalry. The darker side of Chivington was revealed in the complaints of a captured Confederate chaplain, who wrote that Chivington had threatened to kill the prisoners whom he took at Johnson's Ranch. In November 1862, Chivington was appointed brigadier general of volunteers, but the appointment was withdrawn in February 1863. In the fall of 1864, several events took place. 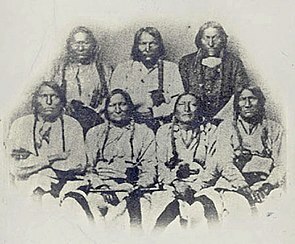 Major Edward Wynkoop received a letter from Black Kettle requesting a peace council and an exchange of prisoners, and Wynkoop succeeded in holding a conference with multiple Cheyenne and Arapaho chiefs, including Black Kettle and Left Hand, and securing the release of some prisoners who had been taken during earlier Dog Soldier raids. Wynkoop and Captain Silas Soule, after the peace conference, traveled to Denver with both the returned prisoners and some of the chiefs. Wynkoop convinced a reluctant Territorial Governor John Evans to meet with the chiefs. Known as the Camp Weld Conference,  it resulted in Evans making an offer of protection to those Indians who would surrender to Major Wynkoop at Fort Lyon. The chiefs agreed, and, after gathering their peaceful tribes, camped about 40 miles north of Fort Lyon, at Big Sandy Creek. After resettling his mostly Southern Cheyenne people, and hearing from Major Anthony that the distribution of provisions was ended, Black Kettle sent most of his warriors to hunt, leaving only 60 men in the village, most of them too old or too young to hunt. Dog soldiers and other Indian warriors were not part of the Sand Creek encampment. In November, setting out from Fort Lyon, Colonel Chivington and his eight hundred troops of the First Colorado Cavalry, Third Colorado Cavalry and a company of First New Mexico Volunteers marched nearly to the reservation. On the night of November 28, after camping, soldiers and militia drank heavily and celebrated the anticipated fight. On the morning of November 29, 1864, Chivington ordered his troops to attack. Edmund Guerrier provided testimony to Congressional investigators at Fort Riley, Kansas in 1865 concerning the Sand Creek Massacre. With Chivington's declaring his forces had won a battle against hostile Cheyenne, the action was initially celebrated as a victory. Some soldiers displayed Indian body parts as trophies in Denver saloons. However, the testimony of Soule and his men resulted in a U.S. Congressional investigation into the incident, which concluded that Chivington had acted wrongly. Chivington was soon condemned for his part in the massacre, but he had already resigned from the Army. The general post- Civil War amnesty meant that criminal charges could not be filed against him. [ citation needed] An Army judge publicly stated that the Sand Creek massacre was "a cowardly and cold-blooded slaughter, sufficient to cover its perpetrators with indelible infamy, and the face of every American with shame and indignation". Public outrage at the brutality of the massacre, particularly considering the mutilation of corpses, was intense. It was believed to have contributed to public pressure to change Indian policy. The Congress later rejected the idea of a general war against the Indians of the Middle West. After living briefly in California, Chivington returned to Ohio to farm. Later he became editor of a local newspaper. In 1883, he campaigned for a seat in the Ohio legislature, but withdrew when his opponents drew attention to the Sand Creek Massacre. He returned to Denver where he worked as a deputy sheriff until shortly before his death from cancer in 1894. His funeral took place at the city's Trinity United Methodist Church before his remains were interred at Fairmount Cemetery. Chivington violated official agreements for protection of Black Kettle's friendly band. He also overlooked how the massacre caused the Cheyenne, Arapaho, and Sioux to strengthen their alliance and to accelerate their raids on white settlers. 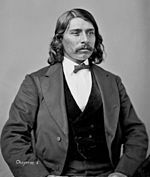 Until he died, Chivington still claimed to have been justified in ordering the attack, consistently stating, "I stand by Sand Creek." In 1887, the unincorporated settlement of Chivington, Colorado, was established and named after John Chivington. The railroad town on the Missouri Pacific Railroad line was fairly close to the site of the massacre. In the 1920s and 1930s, it was largely depopulated by the Dust Bowl, but some buildings still remain. In George Sherman's 1951 Western Tomahawk, set several years after the Sand Creek massacre, Army Lt. Tob Dancy brags to Julie Madden, whose wagon his patrol is escorting, about having ridden with Chivington years before. The movie's main character, frontiersman Jim Bridger, later tells Julie that his wife had been chief Black Kettle's daughter and that the teenage Cheyenne girl accompanying him, Monahseetah, is her sister and the only survivor of a massacre perpetrated by Chivington and his men. Bridger suspects Dancy to be his wife's murderer and pursues him after Dancy escapes from a battle with the Sioux he had provoked against orders. When confronted, Dancy confirms Bridger's suspicion by claiming to have acted on orders. While Bridger is still beating him up, Dancy is shot by a young Sioux whose friend Dancy had killed (thus initiating the conflict) early in the story. Soldier Blue is a 1970 American Western movie directed by Ralph Nelson and inspired by events of the 1864 Sand Creek massacre. James A. Michener loosely based his character Frank Skimmerhorn in the novel Centennial on Chivington. In the 1978 miniseries based on Michener's novel, Frank Skimmerhorn was portrayed by Richard Crenna. In The Listening Sky, Dorothy Garlock portrayed Chivington as the father of Jane Love. The book provides background detail on Chivington. In the TNT mini-series, Into the West, Chivington was portrayed by Tom Berenger. “There, There” written by Tommy Orange (2018) references the massacre at Sand Creek. ^ a b Cummins, Joseph (2009-12-01). The World's Bloodiest History: Massacre, Genocide, and The Scars They Left on Civilization. Fair Winds. p. 99. ISBN 9781592334025. Retrieved 20 July 2012. ^ Becher, Ronald (1999). Massacre Along the Medicine Road: A Social History of the Indian War of 1864 in Nebraska Territory. Caldwell, ID: Caxton Press. p. 408. ISBN 978-0-87004-387-1. Retrieved May 12, 2011. ^ a b c Beardsley, Isaac Haight (1898). Echoes from peak and Plain or Tales of Life, War, Travel, and Colorado Methodism. New York: Eaton and Maine. ^ Morton, Julius Sterling (1906). Illustrated history of Nebraska: a history of Nebraska from the earliest explorations of the trans-Mississippi region, with steel engravings, photogravures, copper plates, maps, and tables, Volume 2 (Lincoln, NE: Jacob North and Company), p. 196. ^ a b c Laura King Van Dusen, Historic Tales from Park County: Parked in the Past ( Charleston, South Carolina: The History Press, 2013), ISBN 978-1-62619-161-7, p. 33. ^ a b Cahill, Kevin. "Sand Creek Massacre Fall 1864 timeline". Sand Creek Massacre Historical Website. Retrieved February 13, 2016. ^ a b Brown 1970. ^ Michno 2003, p. 159. ^ "Testimony of Colonel J.M. Chivington, April 26, 1865" to the Joint Committee on the Conduct of the War, New Perspectives on the West: Documents on the Sand Creek Massacre. PBS. ^ "George Bent", People, Sand Creek Massacre National Historical Site, National Park Service. "On April 30, 1913, about 53 men were killed and 110 women and children killed, 163 in all killed. Lots of men, women and children were wounded." ^ "His Long Life Ended". Denver Republican. October 5, 1894. ^ Chivington, John Milton, Isabella widow. "Pension File 41647". Records of the Veterans Administration. RG 15. ^ Chivington, Mrs. Sarah (February 4, 1895). "Letter to Pension Examimer Sherman Williams". Chivington Pension file. Pension File 41647. ^ "Sand Creek Massacre research center supported"
^ "Laramie: "Handful of Fire", December 5, 1961". Internet Movie Data Base. Retrieved September 22, 2012. ^ "Ainsile Pryor". Internet Movie Data Base. Retrieved April 9, 2016. Brown, Dee. (1970). Bury My Heart at Wounded Knee: An Indian History of the American West, Owl Books. ISBN 978-0-8050-6669-2. Frazer, Donald S. (1995). Blood and Treasure: The Confederate Empire in the Southwest. Texas A & M University Press. ISBN 978-0-89096-639-6. Michno, Gregory F. (2003). Encyclopedia of Indian Wars: Western Battles and Skirmishes 1850-1890. Missoula, MT: Mountain Press Publishing Company. ISBN 978-0-87842-468-9. West Film Project and WETA. (2001). "John M. Chivington (1821-1894)", New Perspectives on the West: Documents on the Sand Creek Massacre. PBS.